Vladimir “Volodia” Padunov’s office looks like a curiosity shop. A tiara, rattlesnake eggs and other trinkets line the shelves. Cluttered beneath are rolls of film. Hats from the former Soviet Union dangle from the ceiling. A jar of homemade horseradish vodka sits on his desk. The professor himself looks like a caricature, with a direct gaze, lean frame and thinning white hair. He insists on being referred to as “Volodia,” whether that be by students or the Chancellor. 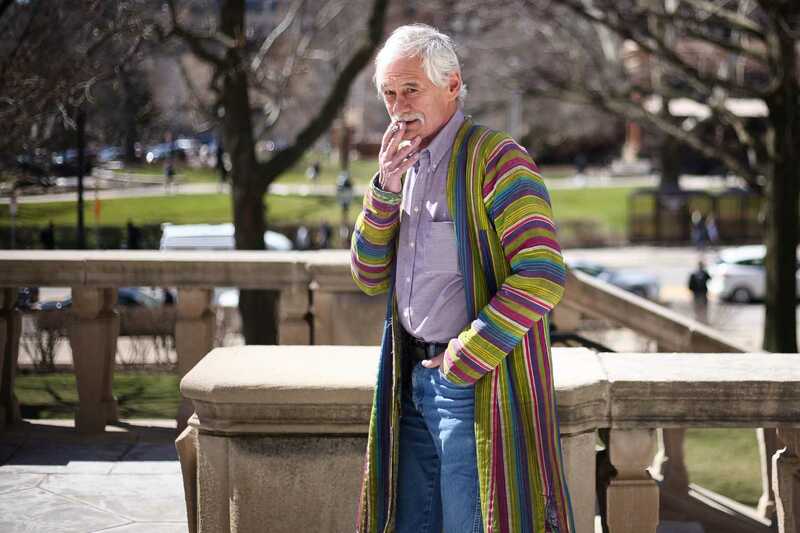 Students may know him as the man wearing a brightly colored coat who often smokes on the Cathedral of Learning patio — which he does 10 minutes to the hour, nearly every hour. His coats, called chapans, come in a variety of eye-catching colors and are common in Central Asia. Padunov started wearing them after he traveled there to serve on a film festival jury in the late ‘90s. Padunov said he wears chapans, and owns items such as an early 20th century lighter, because he doesn’t want to be like everyone else. The Russian-American has been working at Pitt for nearly 20 years as an associate professor in the Slavic languages and literature department and the film studies program. He founded Pitt’s internationally renowned Russian film symposium in 1999, which screens new Russian films and features scholars in film and Slavic studies every spring. Many of the scholars Padunov invites to the symposium come from Russia — the country he could have grown up in. He was born in Germany in 1949 in a displaced persons camp. These camps were created by the Allies after World War II to hold refugees, including slave labor camp survivors like Padunov’s Ukrainian mother and prisoners of war like his Russian father. Most people in these camps were returned to their countries of origin, but some, like Padunov’s parents, did not go back due to shifting borders or fear of being perceived as collaborating with Allied forces. Padunov has no memory of the camp. He and his parents were put on a boat heading to America when he was five. During the voyage, Padunov’s parents were divorced by the ship’s captain. He and his mother ended up in New York City on the Lower East Side — he would only see his father every few years after that. His childhood was difficult. There were no services or aid available to immigrants then, and at first, he did not speak English well. His mother was never able to pick it up. Padunov didn’t get to watch his first movie until he was 13. A babysitter took him to see Alfred Hitchcock’s “Psycho,” and he was immediately hooked. Padunov began watching four to six movies a week after that. He went not only because of his fascination with film but also for the smell of smoke. “In the movie theater, everyone was smoking, and the whole hall was filled with smoke. And I think that's when my love of smoking began,” he said. He managed to resist doing it himself until he was 13, when local bullies pressured him to accept a cigarette. He’s been smoking devotedly ever since. Padunov, who loved reading as a child and would sneak into clubs in the East Village to listen to jazz, was considered mentally delayed in school because English was not his first language. He was able to get into more challenging classes after his English improved and was accepted into Stuyvesant High School in 1962. Vladimir Padunov in his Cathedral office. Padunov went on to study at Brooklyn College, where he witnessed student protests against the Vietnam War. He viewed the demonstrations as anti-American. But Padunov’s views changed in 1968 when he received his draft notice the same day he earned his B.A. He was sent to Thailand to serve as a senior administrative specialist, removing soldiers from the field and reassigning or discharging them. It’s not a time he likes talking about. After returning to the United States for a few days, Padunov fled to Europe, vowing to never return to America. But during the early 70s, he bounced between Europe and the United States, earning his doctorate in Comparative Literature at Cornell and having his first experiences teaching Eastern European studies and film. 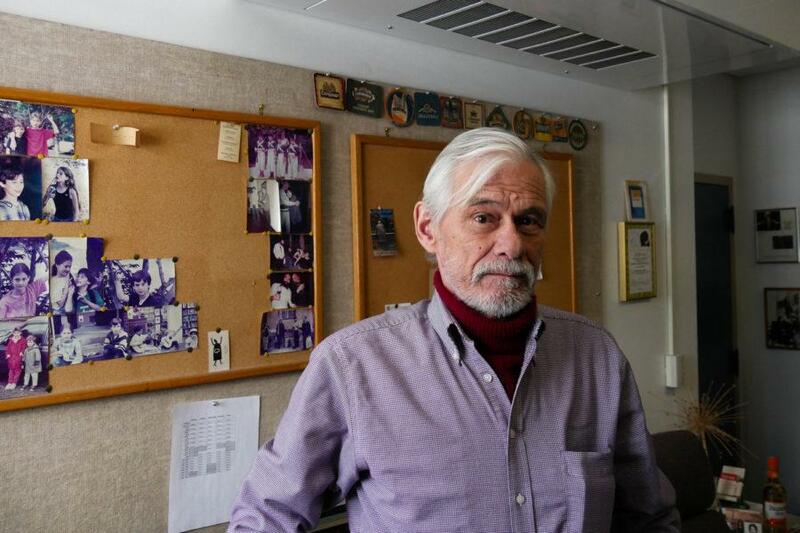 Padunov eventually landed at Hunter College in New York in 1977, where he taught Russian. Inspired by some of his students — Soviet Union immigrants who spoke better Russian than he did — he applied for a grant to study the language more intensely in Moscow in the summer of 1984. While there, Padunov — at this point having been married and divorced three times — met professor Nancy Condee, who would join him for smoke breaks. Condee, Pitt’s current director of the Center for Russian and East European Studies, has been married to Padunov for more than 30 years. “He’s a contrarian. He likes to decide spur-of-the-moment what he’s going to do. If it’s at odds with someone else, even better,” Condee said. When the two returned to the United States, they were both at different colleges. After they married in the early ‘80s, they received grants to teach in Moscow , where they had their first child. Padunov said being in the Soviet Union influenced him to teach more contemporary works because he was able to meet the creators of films and plays he attended. “It’s nice to get drunk with people you’re studying, rather than reading crap sitting in dusty archives,” he said. When their time in Moscow was up, Padunov and Condee returned to the United States in the mid ‘80s. Pitt’s Slavic Department approached the couple with job offers in 1988. Stanford also offered them positions at the time. But Padunov said one of the reasons they settled on Pitt was because Stanford had certain policies that didn’t allow smoking near the university-owned houses. Padunov likes being at Pitt, although he misses teaching comparative literature. But he still enjoys being able to teach about the world through film. “The greater number of angles that you learn to look at the world from, the more interesting the world becomes and the more interesting you become,” he said. In an Intro to Film class one evening in March, Padunov keeps a discussion about queer cinema going — pacing around the front of the room with his hands stuffed in his pockets — as he rebutts or elaborates on answers his students offer up to his questions. Students raise five fingers if they have an answer, two fingers to respond to a comment. “Why are musicals as a category considered queer cinema?” Padunov asks. A student raises five fingers. “I have an idea, but it might be wrong,” he says. Sophomore computer science major Michael Neuman said Intro to Film is one of his favorite classes because Padunov is interested in hearing students’ opinions. Padunov still watches films frequently in his spare time, often for the festivals for which he serves on juries in Eastern Europe. Sometimes, on his way home from work, he will stop in a theater and buy a ticket for whatever is playing next. He refuses to name a favorite film, though.